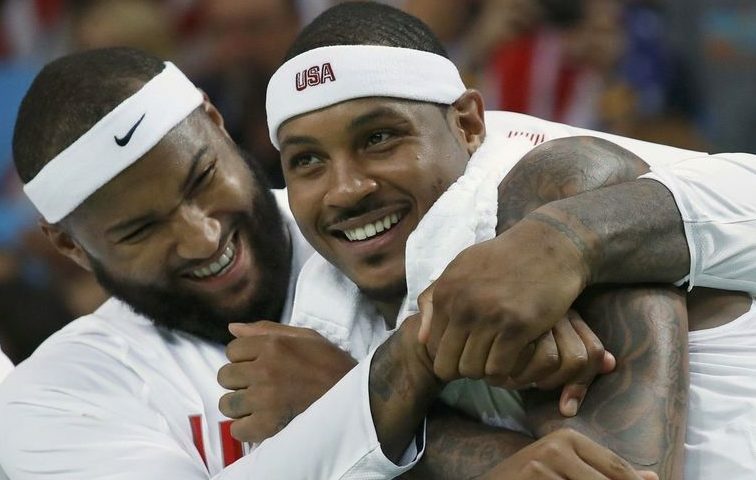 We know DeMarcus Cousins has been recruiting bigger names on the New Orleans Pelicans’ behalf. Now we know one of those marquee talents is Carmelo Anthony. Cousins might be in luck: The New York Post‘s Marc Berman identified them in mid-July as a team that would have interest in trading for Anthony. He’s on the same page as his new squad. But, as noted ad nauseam, Anthony isn’t willing to waive his no-trade clause for anyone other than the Houston Rockets. Convincing him to play for the Cleveland Cavaliers, with LeBron James, is even a tough sell in the aftermath of the Kyrie Irving debacle. Add in the Pelicans’ lack of intriguing trade assets, particularly their inability to send back any truly good deals, and Cousins’ dream appears to be nothing more than just that—a fantasy. It seems more likely that Anthony would waive his no-trade clause for the Portland Trail Blazers, and the chance to play off C.J. McCollum and Damian Lillard. The Pelicans, while deploying two of the game’s five best big men, don’t offer that same kind of playmaking and spacing intrigue.